Paperback, 6.5 x 8.75 in. / 216 pgs / 20 color / 59 bw. Text by Clara Bolívar, Julio García Murillo, Sol Henaro, et al. 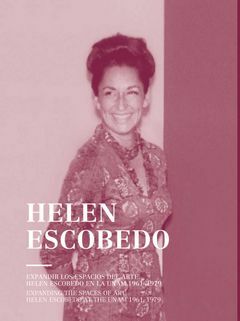 Sculptor and installation artist Helen Escobedo (1934–2010) also helped to shape Mexico’s arts and culture through her work with the government and the national university system. This publication is the first to focus on Escobedo’s influence as a cultural manager. FORMAT: Pbk, 6.5 x 8.75 in. / 216 pgs / 20 color / 59 b&w.